As part of our research work related to nano-optics and nano-photonics, we have developed new concepts and theories together with flexible and reliable numerical codes to describe the complex architectures associated with our current experimental measurements. Among several challenging theoretical objectives related to our activity, we will mention the general theory of Green dyadic functions for electrodynamics computations (field mapping, LDOS, heat dissipation and temperature, far-field and EELS spectra) together with numerical tools for describing plasmon-molecules interactions in the near-field (decay rate, molecule emission pattern, and Maxwell-Bloch equations). The investigation of fundamental aspects and the optimization of the functionalities of complex nano-optical systems, self-assembled on surfaces, or tailored by electronic beam lithography (colloidal plasmonic superstructures, hybrid dielectric-plasmonic components, …) requires an intensive support of both theoretical modelling and numerical simulations. For example, understanding how surface plasmons couple with nearby quantum systems (molecules, diamond NV-center, quantum dots, …) is one of the major questions associated with the development of our experimental activities. Among several challenging theoretical objectives related to our research, we can mention : (i) the study of both emission properties and photon statistics of a quantum system coupled with complex nano-optical structures, including metallic, or hybrid materials, (ii) and (iii) the development of specific numerical imaging tools , including for example two photon luminescence (TPL) and Surface Plasmon Local Density Of States solvers implemented on massively parallel computer, (iv) the studies of optical and electrical force-driven manipulations on surfaces, and (v) the accurate evaluation of dissipation in the multiscale plasmonic structures. These different topics are currently investigated with our home-made FORTRAN codes dedicated to sub-wavelength optics in complex systems. Currently, several programs, developed in the NeO group are available. They are based on the general theory of three-dimensional Green Dyadic Functions (GDF) but when necessary, additional theoretical skills related to the description of van der Waals energy, electrical or optical induced forces are covered by other numerical extensions. Recently, we have developed a concise theoretical framework that can reproduce and analyze experimental photon statistics recorded on hybrid architectures composed of a quantum system coupled with complex dielectric or metallic nanostructures. By directly solving Bloch equations, all illumination regimes are accessible within the same numerical framework. 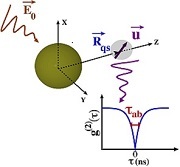 The obtained equations provide information about the mechanisms responsible for the photon antibunching changes (spatial and polarization control, plasmon resonance effects,…). Our method enables direct comparison with the current experimental work with simple geometry (cf Fig.1) but could be generalized to treat complex systems designed at the surface of a sample. Figure 1 : Example of antibunching signal computed near a single gold particle. Extracted from . This formalism is currently applied to investigate the energy exchange and coupling strength between plasmonic structures and two level quantum systems. For metallic objects, the excitation wavelength is an important parameter. The excitation of surface plasmons causes a characteristic field enhancement compared to the incident electromagnetic wave. Different physical quantities can be used to characterize the spectroscopic properties of a self-assembled plasmonic system : the near-field optical spectra that will give the variation of the optical near-field intensity recorded at a given location R above the sample versus the incident wavelength and the far-field extinction spectra. These two quantities can be deduced from the optical electric field induced inside the metal. For example, in framework of the Green Dyadic Functions (GDF) method, the local field distribution induced by an external light field is expanded on a three-dimensional mesh built inside the volume of the particles. It has been used to simulate near-field optical images and spectra in the vicinity of complex colloidal assemblies. Figure 2 : Example of GDF simulation near an ensemble of gold cubes deposited on a glass surface. Left : top view of the structure. Right : near-field map (extracted from ). When computed at the surface of a plasmonic metal, the LDOS is named SP-LDOS for Surface Plasmon LDOS. In fact, when dealing with ultrathin gold microcrystals (for example platelets) the control of the plasmon eigenmodes supported by these 2D electron gas, needs a preliminary computation of the SP-LDOS. This first numerical procedure will permit to select the regions where the system will be efficiently coupled with the light beam. To compute this SP-LDOS scalar function and the complete map generated by the device, the main difficulty lies in the computation of the Green Dyadic Tensor (GDT) just below the surface of the metal. When dealing with bottom-up plasmonic nanostructures deposited on a surface, our previous developments of computation methods in real space provide the convenient tool to derive the GDT in visible and IR frequency range. This dyadic tensor can be computed by solving numerically the Dyson equation with a good numerical accuracy. To achieve the simulations associated with complex plasmonic arrangements we apply a volume discretization scheme based on the use of either cubic (cartesian) or hexagonal-compact grids. Figure 3 : Example of SP-LDOS maps computed inside hexagonal gold platelets (L=700nm). More details can be found in the supplementary information of reference . The ability to form and reform connections between building blocks of colloidal plasmonic circuits investigated in our group needs additional theoretical support. A considerable effort is being directed towards the theoretical understanding of optical forces as a means for controllable assembly. Concerning the light induced manipulation mechanism, forces and binding energies can be deduced from the couple of local electric and magnetic fields optically induced inside the metal of interacting species. Here once more, we use our GDF method for the computation of the electromagnetic field. From these data, we have computed the binding optical forces between closely interacting metal objects and study how they can be used to move and contact them. The influence of the illumination parameters (polarization, wavelength, light beam shaping, ...) are being considered as a way to achieve dynamic reconfigurable plasmonic assemblies. Figure 4 : Example of energy map computation resulting from the optical binding between a micrometric latex bead and a gold disk (A) color map with scale in meV ; (B) corresponding 3D representation (extracted from ). Recent studies have shown that it is possible to use surface plasmons to generate heat nano-sources whose intensity is tunable with the wavelength of the excitation radiation. We have conceived new versatile analytical and numerical methods for the three—dimensional computation of the temperature rising in the vicinity of coplanar plasmonic structures. The formalism supports any form of lighting mode and is adapted to the description of near—field polarisation effects. A broad variety of geometries can be investigated with this technique. In the following illustration, we focus on a planar periodic array of elongated particles sustaining transverse and longitudinal plasmon modes. In this case, we show a simple temperature rising control of the surroundings when turning the incident linear polarization. A realistic description of such localized dissipation effects is directly related to a proper description of the imaginary parts of either the dynamical response functions of the nanostructures and the distribution of the electric field intensity lying inside the metal. The total power dissipated by the structures is then computed after integration of this quantity on the whole volume occupied by the metallic part of the device. Figure 5 : Simulation of three temperature maps computed above a set of nine cylindrical gold nanorods (25 x 80 nm) illuminated in normal incidence by a linearly polarized plane wave. The wavelength is fixed at 680 nm, close to the center of the longitudinal plasmon band. (A) sample geometry ; (B) to (D) temperature map evolution versus incident polarization (extracted from ).